Welcome to the AshcroftGlass.com website (the “Site”) describes the terms and conditions applicable to your access and use of the Site and the web store (the “Web Store”) that sells “Ashcroft” glass products (the “Products”) made available through or in connection with the Site (collectively, the “Service”).This ToU sets forth the terms and conditions under which Ashcroft Fine Glassware USA LLC (“Ashcroft,” “we” “us,” or “our”) provides you access to the Site and the Service. YOUR USE OF THE SITE AND/OR THE SERVICE, OR BY CLICKING "I ACCEPT" IF PRESENTED WITH THIS TOU IN A CLICK-THROUGH FORMAT, SIGNIFIES THAT YOU AGREE TO THIS TOU AND CONSTITUTES YOUR BINDING ACCEPTANCE OF THIS TOU, INCLUDING ANY MODIFICATIONS THAT Ashcroft MAKES FROM TIME TO TIME. Ashcroft will revise this ToU as the Site and/or Service evolves. The next time you use the Service after such an update, you may be prompted to agree to or decline the revised ToU. You must agree to all revisions if you choose to continue using the Site and/or Service. By using the Site and/or Service, you agree to the then-current version of this ToU as posted on the Site. If at any point you do not agree to any portion of the then-current version of this ToU, you must immediately stop using the Site and/or Service. Ashcroft reserves the right to deny service to any person at Ashcroft's sole and absolute discretion. The Service is offered with the understanding that Ashcroft may terminate your access to the Service at any time, for any reason or no reason, including without limitation for any violation of this ToU. Ashcroft may stop offering and/or supporting the Service at any time. 1. After you place an order we will review the information you provided for validity by verifying your method of payment, billing and/or shipping address. Orders will not be accepted for delivery outside of the United States. We may contact you (via email or phone) if additional information is required to accept your order. Invalid order information will result in delays processing your order. For Product purchases, your receipt of an order confirmation does not constitute Ashcroft's acceptance of your order. Without prior notification, Ashcroft maintains the right to limit the Product order quantity and the right to refuse to sell Products to any customer for any reason or no reason at all. Ashcroft reserves the right not to sell to resellers. If your order is canceled, we will attempt to notify you using the e-mail address you have given us with the order. You will not be charged if your order is canceled. If your payment method has already been charged for an order that is later canceled, Ashcroft will issue you a refund. 2. Ashcroft does sell products through its Web Store for children, but only to adults, who can purchase with a credit card or other permitted payment method as described above. If you are under 18, you may use the Web Store only with involvement of a parent or guardian. 3. We accept various payment methods for Product purchases through our Web Store, including various credit cards and debit cards. We will bill your payment method when you place an order for a Product through the Service. Ashcroft will not fulfill any Product order without authorization validation of your purchase from your payment method. 4. You acknowledge and agree that any offers made available through the Service are subject to change at any time and from time to time. Additionally, we have endeavored to be as accurate as possible in describing and displaying the colors and other features of the Products made available for purchase through the Service; however, there is no warranty or guarantee that the colors, sound quality, product descriptions or other content of the Service is accurate, complete, reliable, current, or error-free. 5. We will ship the Products you purchase via the shipping method of our choice, on such other terms and conditions (such as applicable shipping and handling fees) that we may disclose to you at the time of your purchase. We do not guarantee the services of any shipping service and delivery dates and times are not guaranteed. During busy times, such as holiday periods, and periods of inclement weather, there can be additional processing and shipping delays. If there is a problem with a delivery, including, but not limited to, damage, loss or late delivery, you agree to hold shipping service liable and to contact Ashcroft Consumer Support to resolve the issue. You agree not hold Ashcroft liable for any shipping issues. Most package carriers have a short time frame in which to initiate claims. We recommend that you inspect your package for damage immediately upon arrival. If there is a problem, contact the delivery service immediately to resolve any problems. All merchandise is shipped F.O.B. from any place we designate the merchandise leave. At our discretion, we may choose to halt, or alter, the delivery of an order, even though it is in the hands of a delivery agent or shipping company. We may do this as a customer service or in cases where we suspect fraud. You agree to pay any additional charges that may arise due to circumstances in which we take this action. 6. Products purchased from AshcroftGlass.com are easily returned within 30 days of receipt of shipment in accordance with our return policy. These Products must be in new condition with original packaging and accessories. Ashcroft permits you to view and use a single copy of the Site solely for your personal, non-commercial use. You agree not to license, create derivative works from, transfer, sell or re-sell any information, content, or services obtained from the Site. Ashcroft reserves the right to add or remove information, content or Services from the Site at any time at its sole discretion. You may not connect to or use the Site and/or Service in any way not expressly permitted by this ToU. Without limiting the foregoing, you agree that you will not: (a) institute, assist, or become involved in any type of attack, including without limitation denial of service attacks, upon the Site and/or Service or otherwise attempt to disrupt the Site and/or Service or any other person's use of the Site and/or Service; or (b) attempt to gain unauthorized access to the Site, Service, or the computer systems or networks connected to the Site and/or Service. Furthermore, you may not use the Site or Service to develop, generate, transmit or store information that: (i) is defamatory, harmful, abusive, obscene or hateful; (ii) in any way obstructs or otherwise interferes with the normal performance of another person's use of the Site and/or Service; (iii) performs any unsolicited commercial communication not permitted by applicable law; (iv) constitutes harassment or a violation of privacy or threatens other people or groups of people; (v) is harmful to children in any manner; (vi) violates any applicable law, regulation or ordinance; (vii) makes any false, misleading or deceptive statement or representation regarding Ashcroft and/or the Service; or (viii) constitutes phishing, pharming or impersonates any other person, or steals or assumes any person's identity (whether a real identity or online nickname or alias). The Site may contain links to websites operated by other parties. Ashcroft provides these links to other websites as a convenience, and use of these websites is at your own risk. The linked websites are not under the control of Ashcroft, and Ashcroft is not responsible for the content available on the other websites. Such links do not imply Ashcroft's endorsement of information or material on any other website and Ashcroft disclaims all liability with regard to your access to and use of such linked websites. Unless otherwise set forth in a written agreement between you and Ashcroft, you must adhere to Ashcroft's linking policy as follows: (i) the appearance, position and other aspects of the link may not be such as to damage or dilute the goodwill associated with Ashcroft's and/or its licensors' names and trademarks, (ii) the appearance, position and other attributes of the link may not create the false appearance that your organization or entity is sponsored by, affiliated with, or associated with Ashcroft, (iii) when selected by a user, the link must display the Site on full-screen and not within a "frame" on the linking site, and (iv) Ashcroft reserves the right to revoke its consent to the link at any time and in its sole discretion. The Service includes features that operate in conjunction with certain third party social networking websites that you visit ("Social Network Features"). While your use of the Social Network Features is governed by this ToU, your access and use of third party social networking websites and the services provided through these websites is governed by the terms of service and other agreements posted on these websites. It is impossible for Ashcroft to determine in each case whether your use of the Social Network Features would cause you to violate or breach the terms of service and/or other agreements posted on these third party websites. You understand and acknowledge that your use of the Social Network Features may cause you to violate or breach the terms of service and other agreements posted on these third party websites which could result in the termination of your account and ability to access these third party websites and, in some cases, could give rise to liability for damages. YOU AGREE THAT YOU ALONE ARE RESPONSIBLE FOR YOUR USE OF THE SOCIAL NETWORK FEATURES AND THAT Ashcroft WILL NOT BE LIABLE TO YOU OR ANYONE ELSE FOR YOUR VIOLATION OR BREACH OF ANY TERMS OF SERVICE OR OTHER AGREEMENT THAT MAY RESULT FROM YOUR USE OF THE SOCIAL NETWORK FEATURES. Ashcroft, and the logo are trademarks/service marks of Ashcroft Fine Glassware USA LLC. Unauthorized use of any Ashcroft trademark, service mark or logo may be a violation of federal and state trademark laws. The Site and Service and the content made available through the Site and Service are protected by U.S. and international copyright laws. You may not use, modify, reproduce or distribute any of the content, or the design or layout of the Site or Service, or individual sections of the content, design or layout of the Site without Ashcroft's express prior written permission. 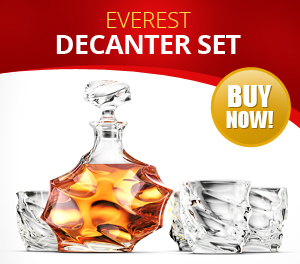 The Site and the Service are operated by Ashcroft Fine Glassware USA, LLC in the United States. Those who choose to access the Site, and/or the Service from locations outside the United States do so on their own initiative and are responsible for compliance with applicable local laws. Ashcroft does not claim ownership of any materials you make available through the Site. At Ashcroft's sole discretion, such materials may be included in the Service in whole or in part or in a modified form. With respect to such materials you submit or make available for inclusion on the Site, including without limitation the Postings (as defined below) you grant Ashcroft a perpetual, irrevocable, non-terminable, worldwide, royalty-free, fully paid-up and non-exclusive license to use, copy, distribute, publicly perform, display, modify, create derivative works, and sublicense such materials or any part of such materials. You hereby represent, warrant and covenant that any materials you provide do not include anything (including, but not limited to, text, images, music or video) to which you do not have the full right to grant the license specified in this Section 11. You also grant us the right, but not the obligation, to use your name, likeness, and identity in connection with your Postings. You also grant other users of the Site permission to access, use, record, reproduce, distribute, publicly display, publicly perform, and prepare derivative works of your Postings in any medium (whether now known or later developed). You voluntarily waive all moral rights you may have in your Postings. We do not guarantee any confidentiality with respect to any Postings that you may submit, upload, post or otherwise provide to the Site, and it is your responsibility to protect any rights that you may have in your Postings. Please also be aware that any personally identifiable information that you choose to include in your Postings for publication on the Site will not be protected. If Ashcroft has provided you with any free or discounted product or other item of value (other than sales and discounts available to the general public), you agree to disclose the value received in your Postings in compliance with Section 5 of the Federal Trade Commission Act. The Site may provide users with the ability to post messages on the Site. Ashcroft is under no obligation to review any messages, information or content ("Postings" )posted on the Site by users and assumes no responsibility or liability relating to any Postings. Notwithstanding the above, Ashcroft may from time to time monitor the Postings on the Site and may remove any Postings at its sole discretion. The Site and the Service are not directed toward children under 13 years of age nor does Ashcroft knowingly collect information from children under 13. If you are under 13, please do not submit any personally identifiable information to Ashcroft. THE SITE, PRODUCTS AND SERVICE ARE PROVIDED ON AN "AS IS" AND "AS AVAILABLE" BASIS FOR YOUR USE, WITHOUT WARRANTIES OF ANY KIND, EITHER EXPRESS OR IMPLIED, INCLUDING WITHOUT LIMITATION THE WARRANTIES OF MERCHANTABILITY, FITNESS FOR A PARTICULAR PURPOSE, TITLE, NON-INFRINGEMENT, AND THOSE ARISING FROM COURSE OF DEALING OR USAGE OF TRADE. Ashcroft MAKES NO WARRANTY AS TO THE ACCURACY, COMPLETENESS OR RELIABILITY OF ANY CONTENT AVAILABLE THROUGH, OR THE PERFORMANCE OF, THE SITE OR THE SERVICE. YOU ARE RESPONSIBLE FOR VERIFYING ANY INFORMATION BEFORE RELYING ON IT. USE OF THE SITE AND/OR THE SERVICE IS AT YOUR SOLE RISK. Ashcroft DOES NOT WARRANT THAT YOU WILL BE ABLE TO ACCESS OR USE THE SITE AND/OR SERVICE AT THE TIMES OR LOCATIONS OF YOUR CHOOSING; THAT THE SITE OR THE SERVICE WILL BE UNINTERRUPTED OR ERROR-FREE; THAT DEFECTS WILL BE CORRECTED; OR THAT THE SITE OR THE SERVICE ARE FREE OF VIRUSES OR OTHER HARMFUL COMPONENTS. TO THE MAXIMUM EXTENT PERMITTED BY LAW, Ashcroft, ITS AFFILIATES, LICENSORS AND BUSINESS PARTNERS (COLLECTIVELY, THE "RELATED PARTIES") DISCLAIM ALL LIABILITY, WHETHER BASED IN CONTRACT, TORT (INCLUDING NEGLIGENCE), STRICT LIABILITY OR OTHERWISE, AND FURTHER DISCLAIMS ALL LOSSES, INCLUDING WITHOUT LIMITATION DIRECT, INDIRECT, INCIDENTAL, CONSEQUENTIAL, OR SPECIAL DAMAGES ARISING OUT OF OR IN ANY WAY CONNECTED WITH ACCESS TO OR USE OF THE SITE, PRODUCTS AND/OR SERVICE, EVEN IF Ashcroft AND/OR RELATED PARTIES HAVE BEEN ADVISED OF THE POSSIBILITY OF SUCH DAMAGES. WITHOUT LIMITING THE FOREGOING, IN NO CASE SHALL THE LIABILITY OF Ashcroft OR ANY OF THE RELATED PARTIES EXCEED THE LESSER OF (I) US$100.00 OR (II) THE AMOUNT YOU PAID US FOR USE OF THE SITE OR SERVICE DURING THE SIX (6) MONTHS PRIOR OT THE TIME THE CAUSE OF ACTION GIVING RISE TO THE LIABILITY AROSE.Ashcroft WILL NOT BE RESPONSIBLE OR LIABLE, UNDER ANY CIRCUMSTANCES, FOR ANY LOSS, LIABILITY, EXPENSES OR DAMAGES INCURRED IN CONNECTION WITH THE SERVICE OR THE PURCHASE OF PRODUCTS, TO THE EXTENT CAUSED BY OR RESULTING FROM (1) YOUR ACTS, DEFAULTS OR OMISSIONS; (2) YOUR VIOLATION OF ANY OF ANY TERM, CONDITION, REPRESENTATION OR WARRANTY CONTAINED IN THIS TOU; (3) YOUR FAILURE TO PROVIDE AN ACCURATE SHIPPING ADDRESS OR OTHER INFORMATION THAT YOU ARE ASKED TO PROVIDE IN CONNECTION WITH THE SALE OF THE PRODUCTS; (4) ACTS OR OMISSIONS OF THIRD PARTIES, INCLUDING THIRD PARTIES CONTRACTED BY Ashcroft; OR (5) NONDELIVERY, MISDELIVERY OR LATE DELIVERY OF PRODUCTS OR PRODUCTS LOST OR DAMAGED IN SHIPMENT. Because some states or jurisdictions do not allow the exclusion or the limitation of liability for consequential or incidental damages, in such states or jurisdictions, the liability of Ashcroft and its affiliates shall be limited to the fullest extent permitted by law. You agree to indemnify, defend and hold Ashcroft and the Related Parties harmless from any and all claims, demands, damages or other losses, including reasonable attorneys' fees, resulting from or arising out of your use of the Site and/or the Service, your negligent or intentional misuse of the Products or any breach by you of this ToU or any other policies that Ashcroft may issue for the Site and/or Service from time to time. This ToU is governed by, and will be construed under, the laws of the United States of America and the law of the State of California, without regard to conflict of law principles. The application of the United Nations Convention on Contracts for the International Sale of Goods is expressly excluded. Except as provided in Section 18 below (and claims proceeding in any small claims court), all disputes arising out of or related to your use of the Site, the Products and/or the Service shall be subject to the exclusive jurisdiction of the state and federal courts located within Los Angeles, California and you agree to submit to the personal jurisdiction and venue of such courts. You and Ashcroft agree that, except as provided in Section 18.4 below, all disputes, controversies and claims related to this ToU (each a "Claim"), shall be finally and exclusively resolved by binding arbitration, which may be initiated by either party by sending a written notice requesting arbitration to the other party. Any election to arbitrate by one party shall be final and binding on the other. The arbitration will be conducted under the Streamlined Arbitration Rules and Procedures of JAMS that are in effect at the time the arbitration is initiated (the "JAMS Rules") and under the terms set forth in this ToU. In the event of a conflict between the terms set forth in this Section 18 and the JAMS Rules, the terms in this Section 18 will control and prevail. Except as otherwise set forth in Section 18.4, you may seek any remedies available to you under federal, state or local laws in an arbitration action. As part of the arbitration, both you and we will have the opportunity for discovery of non-privileged information that is relevant to the Claim. The arbitrator will provide a written statement of the arbitrator's decision regarding the Claim, the award given and the arbitrator's findings and conclusions on which the arbitrator's decision is based. The determination of whether a Claim is subject to arbitration shall be governed by the Federal Arbitration Act and determined by a court rather than an arbitrator. Except as otherwise provided in this ToU, (i) you and Ashcroft may litigate in court to compel arbitration, stay proceedings pending arbitration, or confirm, modify, vacate or enter judgment on the award entered by the arbitrator; and (ii) the arbitrator's decision shall be final, binding on all parties and enforceable in any court that has jurisdiction, provided that any award may be challenged if the arbitrator fails to follow applicable law. BY AGREEING TO THIS ARBITRATION PROVISION, YOU UNDERSTAND THAT YOU AND Ashcroft WAIVE THE RIGHT TO SUE IN COURT AND HAVE A JURY TRIAL. The arbitration will take place in your hometown area if you so notify Ashcroft in your notice of arbitration or within ten (10) days following receipt of Ashcroft's arbitration notice. In the absence of a notice to conduct the arbitration in your hometown area, the arbitration will be conducted in Los Angeles, California, unless the parties agree to video, phone and/or internet connection appearances. You and Ashcroft agree that any arbitration shall be limited to the Claim between Ashcroft and you individually. YOU AND Ashcroft AGREE THAT (A) THERE IS NO RIGHT OR AUTHORITY FOR ANY DISPUTE TO BE ARBITRATED ON A CLASS-ACTION BASIS OR TO UTILIZE CLASS ACTION PROCEDURES; (B) THERE IS NO RIGHT OR AUTHORITY FOR ANY DISPUTE TO BE BROUGHT IN A PURPORTED REPRESENTATIVE CAPACITY OR AS A PRIVATE ATTORNEY GENERAL; AND (C) NO ARBITRATION SHALL BE JOINED WITH ANY OTHER ARBITRATION. You and Ashcroft agree that the following Claims are not subject to the above provisions concerning negotiations and binding arbitration: (i) any Claim seeking to enforce or protect, or concerning the validity of, any of your or Ashcroft's intellectual property rights; (ii) any Claim related to, or arising from, allegations of theft, piracy, invasion of privacy or unauthorized use; and (iii) any claim for equitable relief. In addition to the foregoing, either party may assert an individual action in small claims court for Claims that are within the scope of such court's jurisdiction in lieu of arbitration. This ToU may only be revised in a writing signed by Ashcroft, or published by Ashcroft on the Site. You agree that no joint venture, partnership, employment, or agency relationship exists between you and Ashcroft as a result of this ToU or your use of the Service. Ashcroft may assign this ToU, in whole or in part, to any person or entity at any time with or without your consent. You may not assign the ToU without Ashcroft's prior written consent, and any unauthorized assignment by you shall be null and void. All notices given by you or required under this ToU shall be in writing and addressed to: Ashcroft Fine Glassware USA, LLC, 2360 Corporate Circle. Suite 400, Henderson, NV 89074, ATTN: Legal Department. You hereby agree that Ashcroft would be irreparably damaged if the terms of this ToU were not specifically enforced, and therefore you agree that we shall be entitled, without bond, other security, or proof of damages, to appropriate equitable remedies with respect to breaches of this ToU, in addition to such other remedies as we may otherwise have available to us under applicable laws.